Sadly Sooty our much loved Netherlands Dwarf companion rabbit died April 24th 2013, she was nine years old. Before Sooty came to live with my husband, son and I, she had previously lived with a neighbour of ours who was unable to look after her. Until she found a home with us she spent much of her life alone in a tiny hutch. We had the privilege of enjoying her companionship for only two years during which time she was able to share her life for the first time with another rabbit, Joey, who like Sooty had not had an ideal life and came to us from the RSPCA rabbit rescue. Sadly Joey lived with Sooty and us for only five short months and died of melanoma in September 17th 2012. For Sooty and Joey it was love at first sight. None of the usual bonding difficulties, within hours they were grooming each other and sitting side my side, and except for times when there seemed to be a bit of misunderstanding they were inseperable. It was wonderful to see this tiny little rabbit have some pleasure in her life. 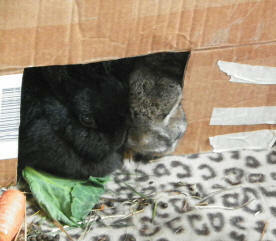 Sooty was able to have the run of the garden and shared a big rabbit run and hutch with her companion Joey. Each morning I would find them sitting side by side where they had been all night. During the winter she came indoors though she much preferred to be outside, although she soon learnt the best place to sit was by the radiator. In the summer she enjoyed sitting in the sunshine or frantically digging in the garden. Like her companion Joey, Sooty was a gentlest of creatures never scratched or made any attempt to bite not even when having medication or other unpleasant medical treatment either at home or at the vets. She enjoyed to be stroke and cuddled. 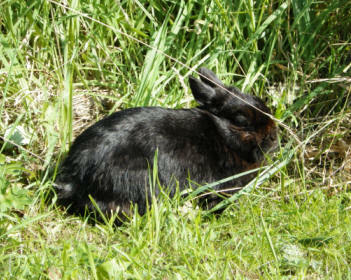 Though an elderly rabbit, with the exception of the occasional episode of conjunctivitis, Sooty seemed in good health until shortly after Christmas when her eye infection seemed not to improve along with a blocked tear duct, also during examination she was found to have a chest infection that would not improve despite weeks of antibiotics. She endured all the eye drops and having her eyes bathed, though it was never easy to administer her medication by mouth, however she never bit or scratched even though she clearly did not like it at all. She endured all this for many weeks until a few days before she died she stopped eating and there was nothing the vets could do despite two days of care in the hospital. It is thought she may have had some underlying condition, possibly a tumour or renal failure as she had lost some weight in the previous couple of weeks. The previous year both Joey and Sooty were taken to our allotment, a large enclosed space with trees, bushes and overgrown grass for a few hours a couple of times each week where they were able to run as rabbits should. Unfortunately this year spring refused to come and sadly little Sooty did not have the opportunity to enjoy this pleasure again before she died as it was just too cold and wet to take her. Sooty will be greatly missed by my husband, son and myself. She brought much pleasure into our lvies and we hope that we brought some happiness into hers in the short time we were able to care for her. It was difficult to let Sooty go and in retrospect perhaps we tried too hard to save her from the inevitable. We feel she knew it was her time when she walked into her pet carrier quite willingly on two occasions when she had to go to the vet before she died, it was as though she knew that this would resolve her suffering. Life is sweet for an animal as it is for us and we wanted to at least give her another spring and summer to play, dig and sleep in the sunshine, but sadly it was not to be.